Hi everyone! I've been in the states for about a month now, trying out new places and old favorites. I've been so busy that I haven't even really spent very much time in LA- I went to Irvine, Newport, San Diego, Las Vegas and Park City. - the Scallop salad at Gulfstream in Century City, CA is one of my favorites. This salad was the beginning of my love for beets. Now I even get a huge scoop of beets when I go to Souplantation. haha! I also can't leave Gulfstream without getting the lemon meringue pie (lusciously light meringue and tart and sweet lemon filling) and the hot fudge sundae that you just can't find in Taipei. 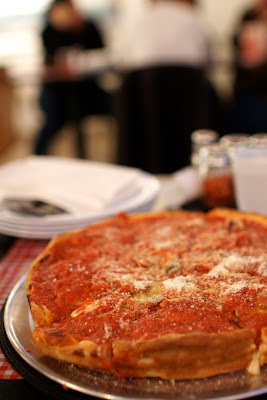 - Deep dish mushroom and sausage pizza at Tony's Little Italy Pizza in Placentia, CA. Definitely no Zachary's, but it hit the spot after I had been searching for deep dish pizza in Southern California for a long time. A tiny restaurant in a strip mall, it was packed on a weekend night. We called ahead with our pizza order (it takes around 45 minutes to bake) and we still had to wait awhile for our food. The meatballs on the spaghetti were huge, but the pizza was better. The hot cheese oozed everywhere and and each slice was dense and filling. - I am in LOVE with the Spicy Tuna Don with brown rice at Fukada in Irvine, CA and I think everyone else is too. The lines on the weekends are painfully long, but this is so so so good. Not too spicy with a touch of sweet, the texture of the brown rice compliments the tuna. The combo special also includes a bowl of udon or soba! - It's hard to capture how HUGE the Snickers Pancake at Hash House A Go Go in Las Vegas, NV was, but maybe you can kind of see with my iPhone in the picture for scale. I gasped when I saw how big it was- the size of a small to medium pizza and enough to feed at least four people. This busy brunch place off the strip was featured on Man Vs. Food for its fried chicken benedicts (which were equally huge) and it was worth the trip off the strip. (Though the Wynn weekend buffet with fresh guacamole and prime rib was pretty enticing too). - There were a lot of new things to try at Bazaar, in Los Angeles, CA, but the cotton candy foie gras had to be one of the most unusual. The melt in your mouth sugary and savory flavors and textures was to be tried in one bite and tasted like you would imagine. When I get back to Taipei, I want to post up the pictures from the rest of the food that night! So that's a little bit from me right now... I'm fighting a cold and it's raining and I have so many places I want to eat and not enough time, but I'll be back to Taipei in a few days and should be back to regularly scheduled blogging in no time!